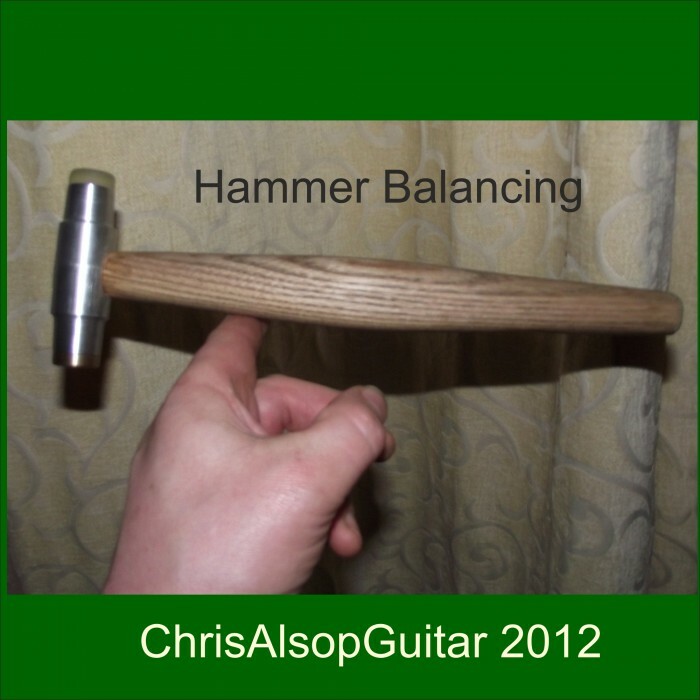 Fretting Hammer with two 20mm faces of Brass and Rubber, designed and manufactured by Chris Alsop. 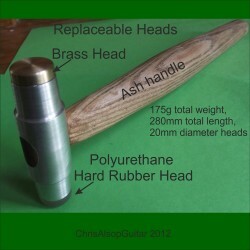 This hammer is supplied with two 20mm diameter faces - it weighs 175g. The hammer is 280mm in length. The hardwood handle is made from close grained Ash. It has replaceable heads that screw in - one is brass and the other hard rubber. The main body is made from aluminium bar tapered down to 20mm each end, drilled and tapped with an M16 Coarse thread. About half the weight (87g) is in the body and half in the handle, which results in the centre of gravity about 1/3 the way along the handle from the head - this is ideal for simultaneous control and ease of use. The eye (the hole in the hammer head) of the hammer is properly milled and is a conical oval shape wider at the end allowing a 2mm wide hardwood hammer wedge to be used to secure the head and make it safe. Traditional hammer design and craftsmanship is used throughout and the hammer stale is particularly robust for a hammer this size, which adds to the strength and comfort in use. 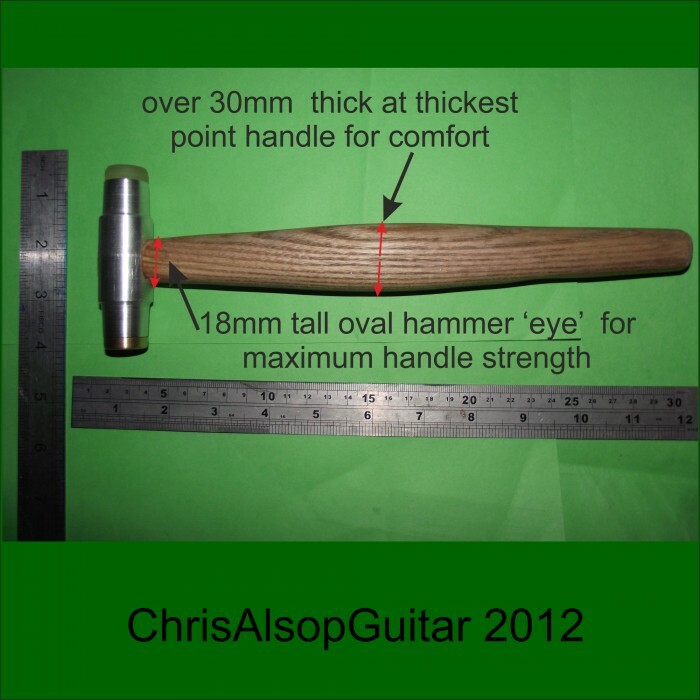 This hammer has enough weight to make the frets to go in easily, but not too much weight to over do it. It is well balanced allowing both good aim and control. The heads - one rubber and one brass - complement each other. The rubber head allows a wide spread of a low impulse across the fret, and the brass head allows a precise tap of a high impulse in a specific place. Both heads are well rounded at the edges. The handle is sanded to have a smooth finish and is heavily treated with linseed oil to condition the wood. The handle can be gripped firmly without slipping. The Ash wood handle is fashioned so it gives the right balance and feel. The hardwood used is close grained Ash which is both light, tough and flexible. 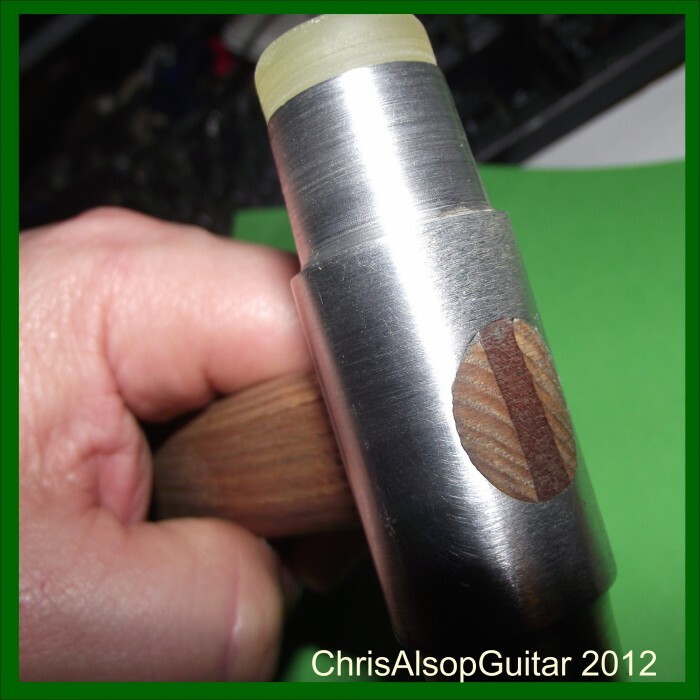 The handle is shaped to bulge to a relatively large thickness at the midpoint- which makes it easy to apply many accurate small taps to seat the fret properly. 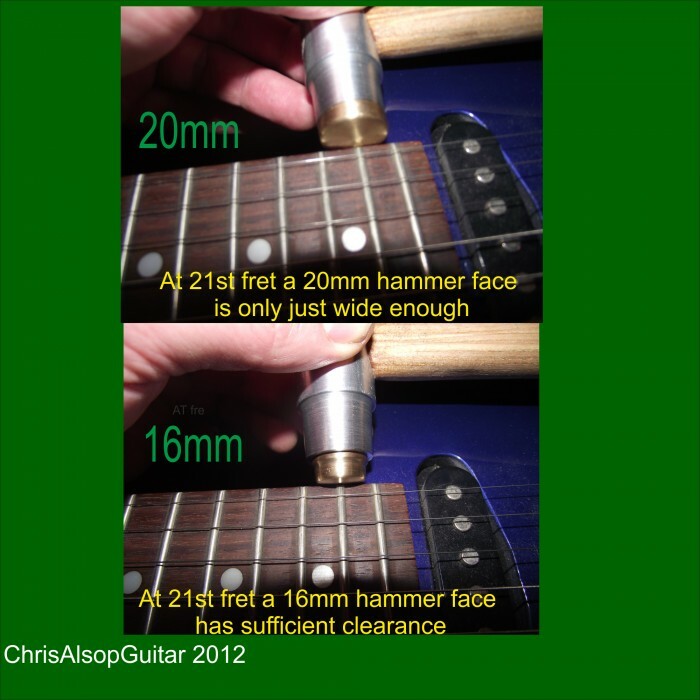 Both the rubber and the brass heads will not dent the fret wire. 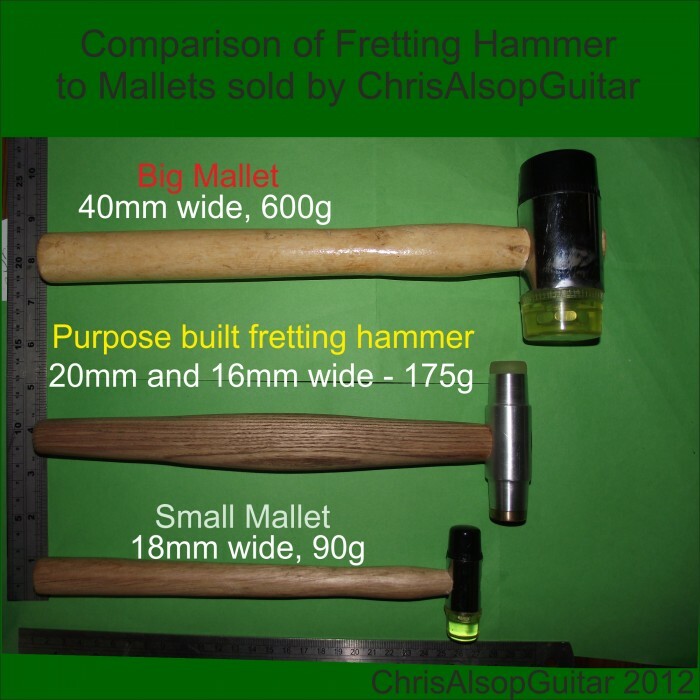 The hammer is made by Chris Alsop, in his Woodville Guitar workshop, to a design that is tried and tested for accurate fret installation.